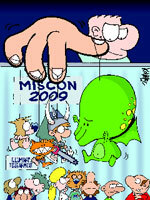 I have not been to MisCon for years, and I miss it. Very, very fun convention in beautiful Missoula, Montana. But they remain completely illuminated, even without Evil Stevie around. Their guest this year is John Kovalic, and look at the cover he's done for their program book. It makes me very happy just to see this. I'm going to be sending them some special goodies for their auction, just because, hey. Miscon. John K. Illumination.